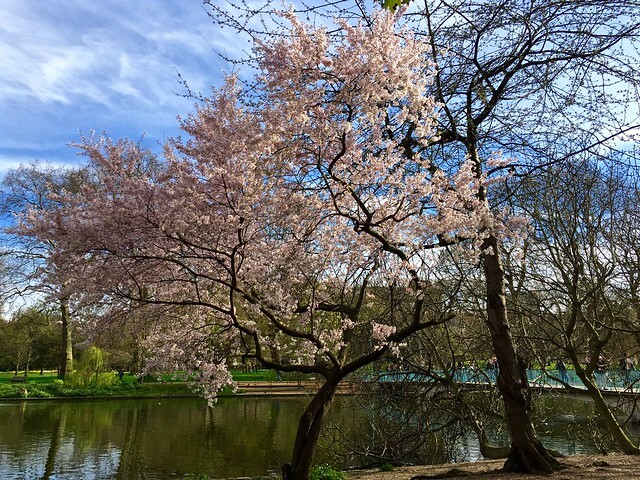 St James’s Park is ranked at number four in my London Parks Cherry Blossom Top Five Guide. 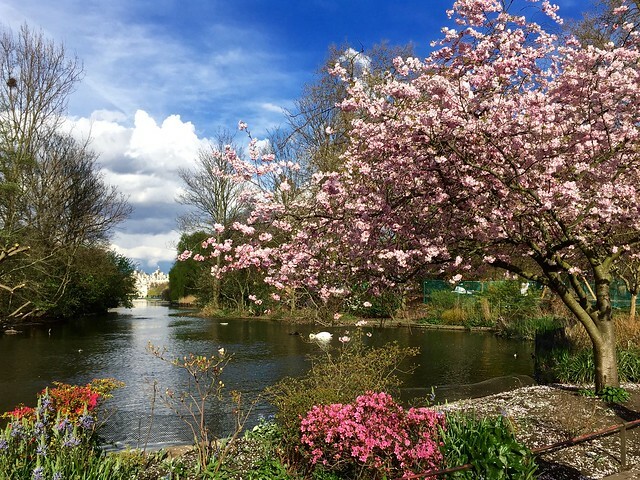 It’s right in the centre of London and has a beautiful lake so it was bound to make the cut, but it doesn’t have great swathes of cherry trees. It’s quality not quantity that gives it its place. Take a walk around my virtual tour to see why. This a circular tour so you can start anywhere, but I’m starting it at the Admiralty Arch corner. 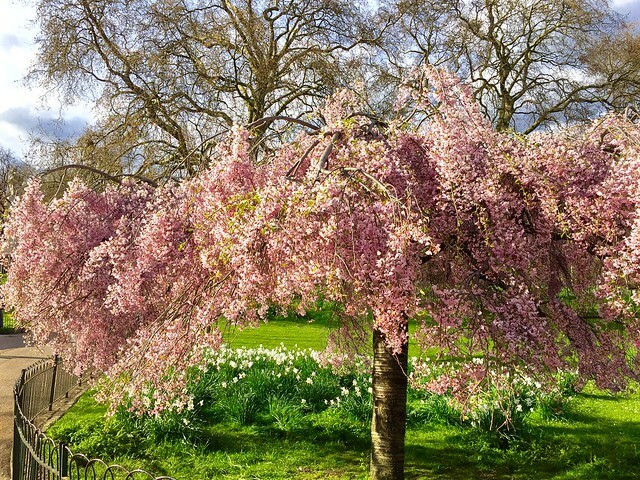 Take the diagonal path into the park towards the blue bridge, passing a single white cherry tree on the right as you go. 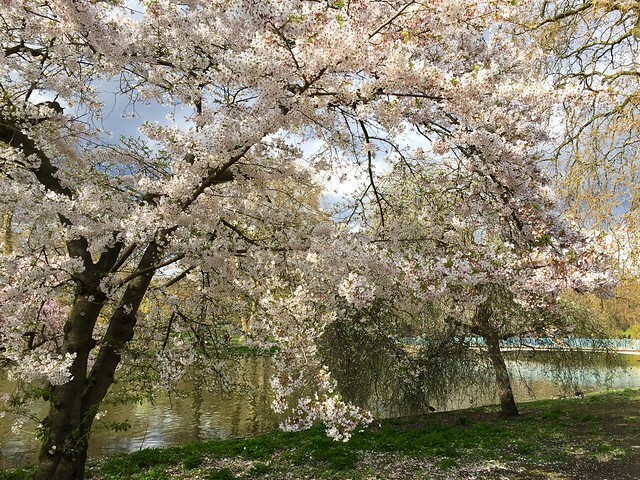 Just by the blue bridge is a beautifully shaped cherry tree, gracefully framed against the water. Walk on down the path without crossing the bridge. As you pass there is a lovely view of a grove of white cherries across the far side of the lake, which I’ll talk about in a moment. 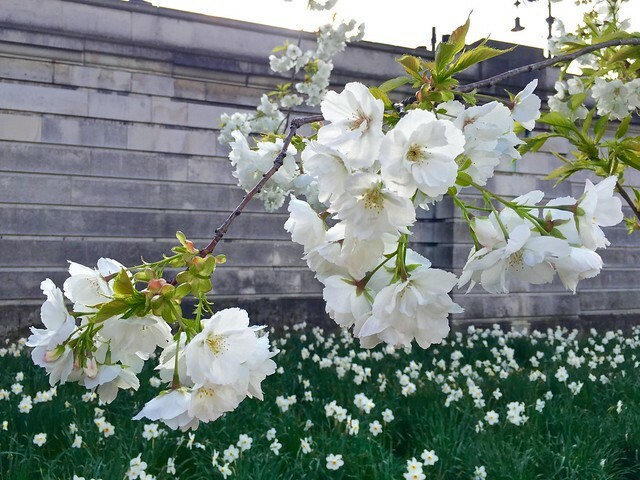 For now, keep on going to the Buckingham Palace end of the park where you’ll find a small weeping cherry and some more white cherries. 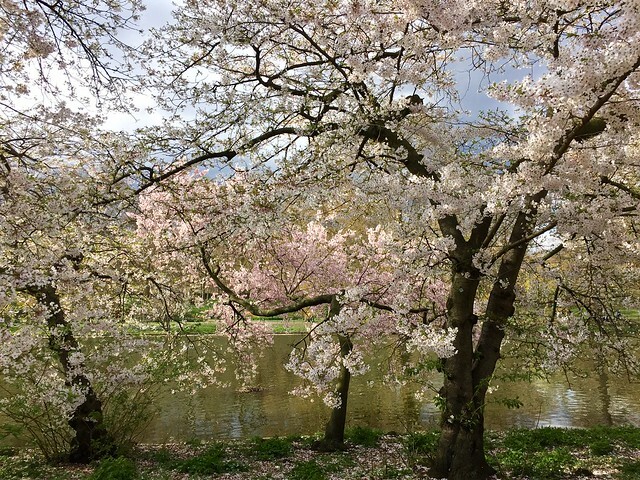 Next comes the best view, of a pink flowering cherry set against the background of the lake with the white turrets of Whitehall in the far distance. Carry on up the slight hill, where there’s another imposing pink cherry and follow the edge of the lake back towards the blue bridge. 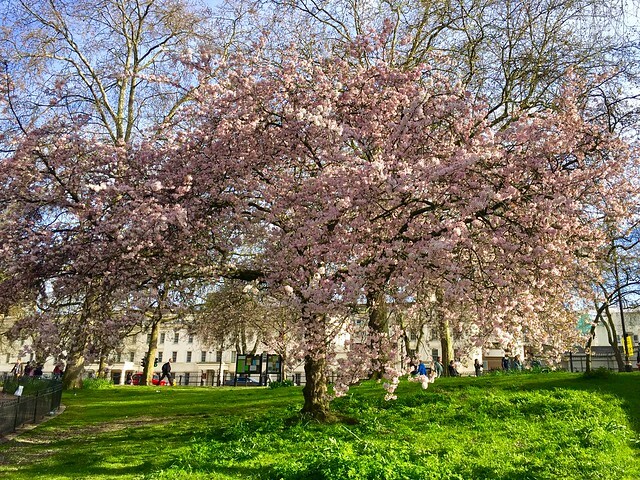 Just before you get there there’s the little grove of white and pink blossoms that I mentioned earlier. A simple point and shoot photo of these trees somehow transforms itself into an Impressionist painting. Walk onto the blue bridge to admire the views of Buckingham Palace, but don’t cross it. Keep walking down to the Storey’s Gate corner of the park where there are seven or eight pink cherry trees in front of the Treasury building with a carpet of narcissi below them. To complete the circle, walk up past Horseguard’s Parade to the Admiralty Arch corner again. 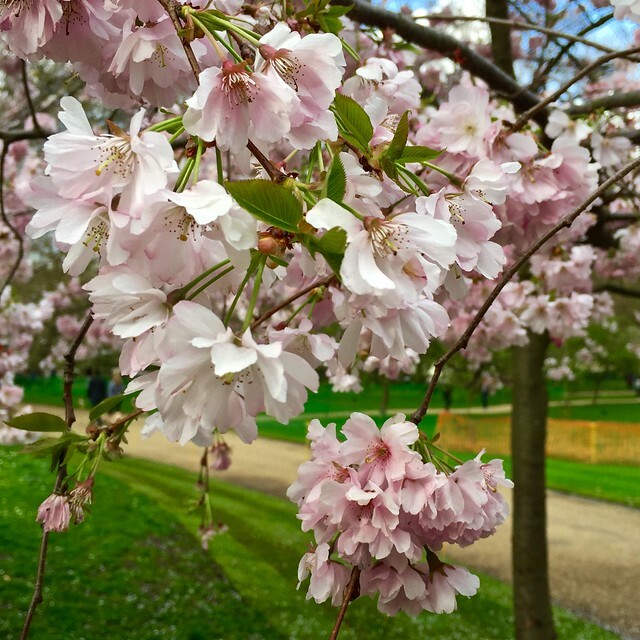 This entry was posted in Cherry Blossom and tagged blossom, blue bridge, flowers, gardens, London, nature, plants, St James's Park, Storey's Gate by Fran. Bookmark the permalink. It must be too late for Cherry blossom now. I will try to go there next year! 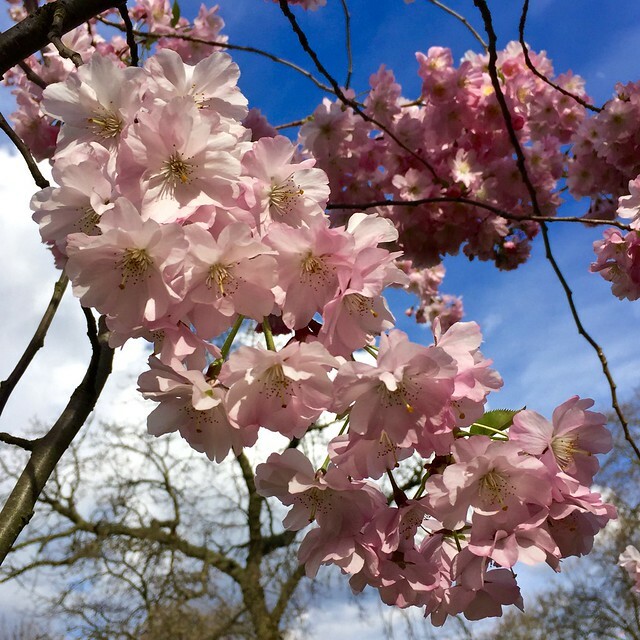 There’s plenty of cherry blossom around at the moment, and more still to come. Don’t give up too soon! Such a beauty these are! 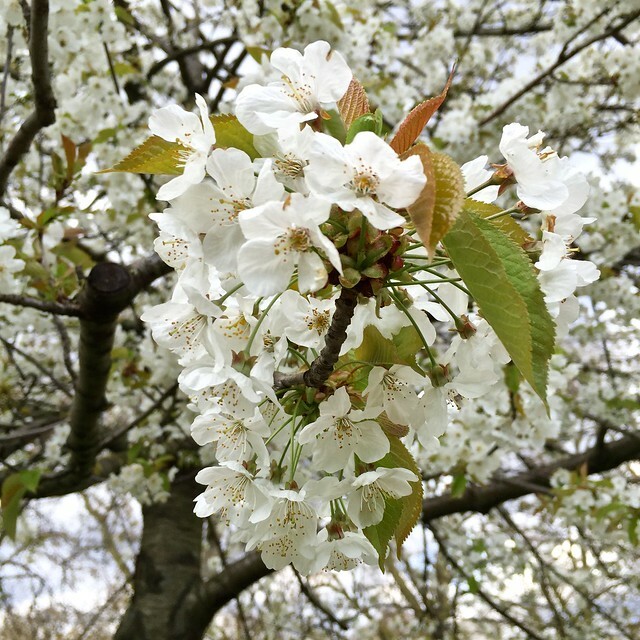 I saw cherry blossoms in Washington last month and wrote about that. I’d love to go to Washington to see the cherry blossom one day!